VANCOUVER, BRITISH COLUMBIA--(Marketwire - Feb. 9, 2012) - Cream Minerals Ltd. (TSX VENTURE:CMA)(OTCBB:CRMXF)(FRANKFURT:DFL) ("Cream" or the "Company") is pleased to announce a new discovery at Nuevo Milenio. Drill hole VT 07-11, an exploration drill hole, oriented NE from the higher grade Veta Tomas vein, intercepted three previously unknown quartz zones with the widest being 4.46 metres. These quartz veins are within a broader intercept of approximately 72 metres. Results for the exploration drill hole VT 07-11 are presented below. Highlights include significant drill intersections, (intersections are not true widths) true widths are expected to be 50% to 70% of drill intersections dependent on the drill inclination. 2.00 metres of 58.30 g/t Ag and 0.476 g/t Au. Drill Hole VT 07-11 drilled at an azimuth of 65°, at -45 was a blue sky hole located in section 16 employing the same setup as drill hole VT 06-11 but drilled at 180° to the trend of Veta Tomas. Quartz veining, fault breccia and quartz stock work were cut from 277.50 metres to 349.46 metres. The objective was to test a section unconformable overlain by rhyolite flows. Geological data suggests that a fault block of Dos Hornos 2 (thought to be Dos Hornos 3) may have been moved to the SE in the approximate area of the rhyolite flows. Hole VT 07-11 did intercept a structure in the area where it is thought Dos Hornos 3 could be located. The zone intercepted by VT 07-11 is a blind zone of silver and gold mineralization associated with quartz veins and quartz stock work overlain by rhyolite flows. Structural considerations suggests this could possibly the Dos Hornos 3 displaced fault block. Inspection of the drill core implies the presence of sub parallel faults similar to the Dos Hornos 2 zone, however additional drilling is required to confirm that the structure is in fact Dos Hornos 3. 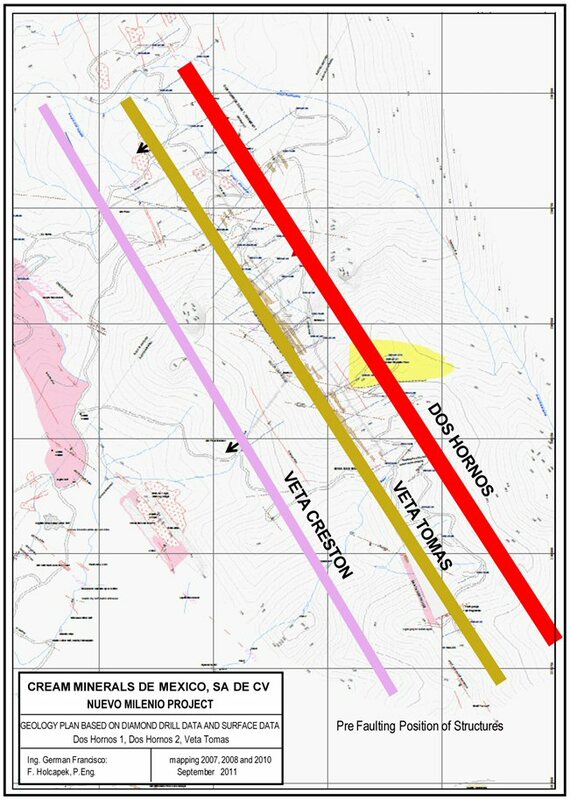 Located in the caldera within the vicinity of the higher grade Dos Hornos 1, Dos Hornos 2 and Veta Tomas veins the presence of a new structure that may be a fault segment of Dos Hornos 2 is an important development and represents a new target for future drilling. Revised NI 43-101 101 Report, dated December 24, 2008 by F. Holcapek, P. Eng. A cut-off grade of US$45.00 per tonne or 131g/t Ag equivalent was used. Samples are prepared in the Preparatory Laboratory of Inspectorate in Durango, Durango. In addition to the in-house check assaying, Cream Minerals De Mexico instructed Inspectorate to take approximately 20% (1 sample out of 5) as marked on the sample shipping paper and take a split from the prepared samples. All samples are shipped to the Inspectorate Laboratory in Reno, Nevada. The check samples are shipped to the Steward Group's Preparation Lab in Zacatecas for shipping to their main Laboratory in Kamloops, B.C. for assaying. All samples are assayed using Inspectorates Genx 30 31 Element Package Au&Ag/FA/AA plus 29 elements ICP-AES Scan by aqua regia digestion & Hg by CVAA. The Steward Group uses their equivalent to the Genx 30 package of Inspectorate for assaying. Mr. Ferdinand Holcapek, P. Eng., Director and Administrator General, Cream Minerals De Mexico, SA de CV, supervises exploration programs on the Nuevo Milenio Project. He is responsible for all technical reporting and is the Company's "Qualified Person" for the purpose of National Instrument NI 43-101. Cream Minerals is a silver-gold exploration company. The Company's flag ship project is the Nuevo Milenio silver-gold project in Nayarit State Mexico. To learn more about Cream Minerals please click here www.creamminerals.com. This news release contains "forward-looking information" within the meaning of applicable Canadian securities regulations and including "forwarding-looking statements" within the meaning of the United States Private Securities Litigation Reform Act of 1995. This forward-looking information is made as of the date of this News Release and except as required under applicable securities legislation, the Company does not intend and does not assume any obligation to update this forward-looking information. Forward looking information is based on management's current expectations and beliefs and is subject to a number of risks and uncertainties that could cause actual results to differ materially from those described in the forward-looking statements. Forward-looking information in this News Release includes, but is not limited to the planned drilling program on the Nuevo Milenio project and the Nuevo Milenio project's estimated mineral resource. Forward-looking information is based on a number of assumptions which management believes are reasonable including that equipment, personnel and approvals will be available when required to complete the planned drilling program, that no disruption to the program will occur as a result of breakdown, labour disputes, or natural hazards, that the assumptions underlying the inferred resources estimate are valid, including but not limited to the projected future prices of silver and gold, continuity of mineralization and grades, and expected recovery methods and rates. Factors which could cause actual results to differ materially from current expectations include, but are not limited to: the risk that actual results of exploration activities will be different than anticipated, that cost of labour, equipment or materials are more than expected, that the future price of silver and/ or gold will differ materially from those implied or estimated, that Canadian / US dollar exchange rates vary in a manner that has a negative effect on the resource estimate, unanticipated delays in obtaining governmental approvals or required financing; that changes in project parameters result in increased costs, of unexpected variations in mineralization, grade or recovery rate and other factors on which the mineral resource estimate is based, of failure of equipment or processes to operate as anticipated, of accidents, labour disputes and other risks generally associated with mineral exploration and development; a deterioration in general economic conditions; and changes in laws, rules and regulations applicable to Cream and the Nuevo Milenio project. The United States Securities and Exchange Commission ("SEC") allows mining companies, in their filings with the SEC, to disclose only those mineral deposits they can economically and legally extract or produce. The Company uses certain terms in this document, such as "mineral resources", and "inferred resources" that are recognized and mandated by Canadian securities regulators but are not recognized by the SEC. U.S readers are cautioned that while the term 'inferred resource' is recognized and required by Canadian regulations, the SEC does not recognize it. "Inferred resources" have a great amount of uncertainty as to their existence, and great uncertainty as to their economic and legal feasibility. It cannot be assumed that all or any part of an inferred mineral resource will ever be upgraded to a higher category. Under Canadian rules, estimates of inferred mineral resources may not form the basis of feasibility or pre-feasibility studies, except in rare cases. U.S. readers are cautioned not to assume that part or all of an inferred resource exists, or is economically or legally mineable.